Your troop can now visit Imagine for a chance to have fun and learn together while earning a museum patch! We have programs for Daisies, Brownies, Junior Girl Scouts, Tiger Cubs, Wolf Scouts, Bear Scouts and Webelos. Your visit will include a one hour educator-led activity and all day Museum admission. Exclusive Imagine Children’s Museum patches are available for purchase for $1 at the time of registration. 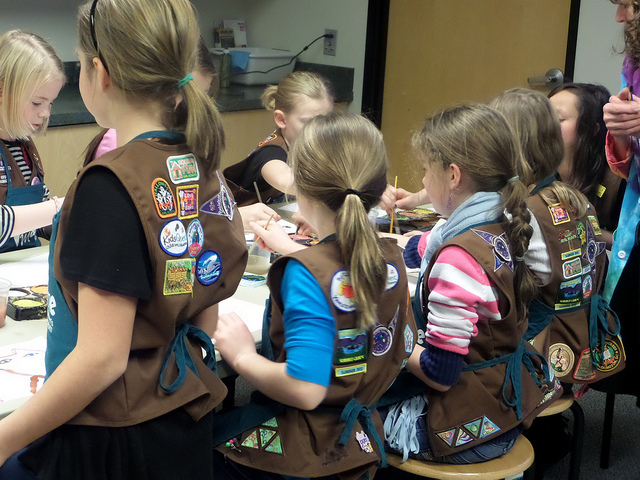 To sign up your troop call 425/258-1006, Ext. 1012. A minimum of two weeks is required when scheduling scout program. Students use their imagination to explore the universe! They will blast off into space with a rocket of their own creation. Students work together to become architects, engineers and builders. They will learn about shapes and test their strengths in design challenges. Students become budding paleontologists through hands-on engagement with fossils. They will gather fossils to assemble their own dinosaur skeleton. Students join their favorite barnyard animals and learn how they help us. They will create their own barnyard craft. Students experiment with rhythm as they keep beat! They will take a musical literacy journey and create their own rhythm sticks. Students investigate Pacific Northwest wild mammals and their habitats. They will discover the unique features that help animals thrive in their environment. Students explore the impacts weather, transportation and communication had on pioneers as they journeyed West. They will interact to design and complete challenges pioneers faced along the Oregon Trail. Students examine how fossils form. They will decipher different types of fossils and use clues to investigate their origins. Students learn about potential, and kinetic energy as they engineer a rollercoaster of recycled materials and test their tracks. Students learn the cultural, historical and scientific significance of tops. They will use a collection of tops to test balance, motion, gravity and energy. Students learn the science behind optical illusions and experience the tricks our brains can play on us. Utilizing teamwork, students work to solve a challenge involving imports and exports. They will learn the Port of Everett’s role in international tradematter and with China, Japan, Russia and South Korea. Students construct buoyancy hypotheses and test them by conducting a series of experiments. Students investigate the properties of experiment with non-Newtonian substances. Students interpret the historical, cultural and social relevance of masks. They will take what they have learned and create a mask with its own unique story. Students explore the cultural and environmental significance of trees and explore their many surprising by-products. They will investigate the anatomy of a tree and create their own treasure.